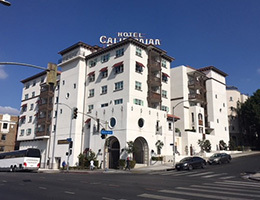 Opened in October 2017 and The Paseo at Californian stands on the site of The Hotel Californian, which opened in 1925 and was a popular hotel in the Westlake area. The Westlake area has been experiencing a resurgence and new growth over the past ten years and that has included building a 53-unit affordable family community on the vacant land where the Hotel Californian once stood. This community consists of one, two and three bedroom apartments. Designed in the Mission Architectural Style, the community is LEED Gold certified with such features including VOC paint and adhesives ensuring pure air quality for occupants. Air quality is further enhanced by the building’s “No Smoking” designation, the use of formaldehyde-free cabinets, all vinyl flooring and the fact that all units’ vent to the unit exteriors allowing for the exchange of outdoor air. Further amenities include high-performance energy efficient windows and heating and air systems, ample storage, access to bicycle parking, a large community room and on-site laundry facilities. Located in close proximity to shopping, schools and the Metro Red Line stop at MacArthur Park. All residents receive an annual subsidized Metro Pass to encourage the use of public transportation. The Paseo at Californian is not currently accepting applications at this time.